I am a master procrastinator. I should be spring cleaning my disaster of a closet right now. Instead, I am blogging about cake…a cake that I made two days ago, when I was also off work and also should have been spring cleaning my closet. Housekeeping gives me the blues, but cake makes me happy! I always buy too many bananas at once, so I have this perpetual stash of them in my freezer, waiting to be turned into smoothies or baked with. Although I want to make every single thing in the book Vintage Cakes, I figured I’d start with a cake that would put some of those bananas to use. 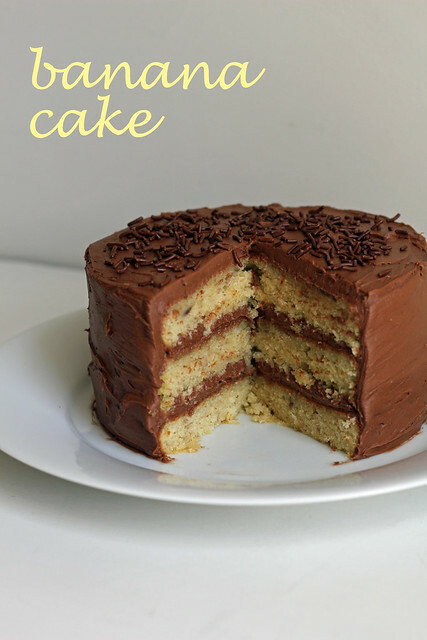 I’ve made one, no two, banana layer cakes here before, so forgive me if I seem like I’m repeating myself. They’re all good….moist, and most definitely cake and not banana bread. I think banana cake is a good match for lots of frostings…cream cheese, chocolate, peanut butter. I didn’t use the coffee walnut buttercream that is paired with this cake in the book. Instead I frosted it with some leftover chocolate frosting that I brought home from work a couple months ago and stuck in the freezer. It’s actually too sweet for my tastes, and isn’t a recipe I’d make at home (which is why I’m not providing it below), so I had to temper that sweetness a bit by rewhipping it with a little cream cheese and some instant espresso. OMG, wait–I used bananas and frosting from the freezer…doesn’t that mean I did some spring cleaning after all? Steph’s Note: I halved the recipe to make 6″ rounds. They took a little less time to bake, about 24 minutes. Frost it with your favorite frosting. -Center an oven rack and preheat the oven to 350°F. Grease three 8″ round cake pans and line them with parchment circles. -In a large bowl, sift together the flour, baking powder, salt, and baking soda, then whisk them together. In a small bowl or a measuring cup, combine the banana with the buttermilk. -In the bowl of a stand mixer fitted with a paddle attachment, cream the butter, sugar, and vanilla together on high speed until fluffy, about 5 minutes, stopping frequently to scrape the sides and the paddle with a rubber spatula. Blend in the eggs one at a time. -With the mixer on low, add the flour mixture in three parts, alternating with the banana mixture in two parts, beginning and ending with the four. After each addition scrape the bowl well. Stop the mixer before the last of the flour has been incorporated and complete the blending by hand with a rubber spatula. -Divide the thick batter equally among the prepared pans, and tap the pans on the counter to settle. -Bake until the centers spring back when lightly touched, 28 – 30 minutes. -Cool the cakes in their pans on a wire rack for 30 minutes. Flip them out and let them continue to cool on the rack, top side up, until they reach room temperature. Leave the parchment paper on until you assemble the cake. -Fill and frost with your favorite frosting. Ohhh this makes me wish I liked bananas! Gee – with 2 cups of sugar in this cake, you should be able to clean those closets in record speed! And you’ll be working it all off, so it’s a win win……Beautiful looking cake. I have some cupboards that need cleaning myself. Think I’ll break out the mixer now. The cake looks gorgeous! Seems to be the most delicious way to use up banana leftovers. looks great Ill have to try! Looks like my kind of cake and very tasty! Yum!!! This has to be made! !